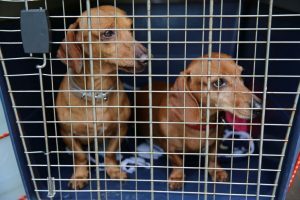 » Are There Dog Crates for 2 Dogs? » PupBox vs. BarkBox- Which is Better? » How Do You Select the Best Dog Supplies? Home » Dog Supplies » Are There Dog Crates for 2 Dogs? Are There Dog Crates for 2 Dogs? Yes, there are dog crates for 2 dogs! When it comes to dog crates, you have a lot of options, including more space for multiple dogs. It all depends on what you are using the crate for. Believe it or not, crates are fantastic potty training tools, and promote safety at the same time- kind of like a playpen for a young child. As long as the size is adequate for the breed, two dogs can most definitely share a crate! In fact, it’s already very natural for dogs to share a ‘den’ in the wild. When many people think of dog crates, they imagine those plastic ‘travel’ boxes offering barely enough room to turn around in, let alone stand up. This type of dog crate usually only offers a small open area for viewing, and must be taken apart to clean. The best crates today are made from durable metal that will last for many years. They are built with more of an open bar rather than a closed off box design, so the dog can easily view his surroundings. They also are very easy to clean and can be folded for easy transport. Though you might pay more for these, they are the only crates you will ever need to buy. Potty Training Note: Crates help with potty training because dogs tend to like to keep their sleeping areas clean, and won’t go to the bathroom in these confined spaces where they must sleep (or at least occupy) if they can help it. Crates are also always recommended for puppy safety when you can’t watch over them! Buy this once, and you’ll never need to invest in another crate for as long as you live. I personally purchased one made of the same material seven years ago, have moved several times, and both my dogs share it comfortably to this day! Not only are you given a plastic floor grid for comfort (the dogs don’t need to walk on metal), you can easily line the floor with blankets and pillows! On top of all this, your crate has wheels for easy movement! Looking for a tough, durable crate that still offers the room you need for two dogs? Not only do you get the durable, lifetime material you get with the last crate on our list, this one offers multiple entrances accessible to both pets, including a ceiling door for your convenience! Your medium breeds will have plenty of room, without too much space. This one is the ultimate package in an entire kit! Not only is this crate extremely durable, just like the two above, it is offered in a much larger size; you never need to worry about space! You get ‘shelf’ spacing for a food and water bowl, which also are included. You have your own ‘crate cover’ if you want to give your pets a ‘cave den’ feel. The kit even comes with a fleece pet bed to line the bottom and make your dog’s den comfortable! The crate is available in several different sizes, so you aren’t restricted to one huge choice. Overall I highly recommend any of these dog crates above, which all work well for 2 dogs.